The most beautiful suite by Canaletto and Brustolon to appear on the market since half a century. First edition and first state of this ravishing and superb suite of views on Venice. Oblong folio [715 x 512 mm] of (1) title p. and 21 full-page plates. 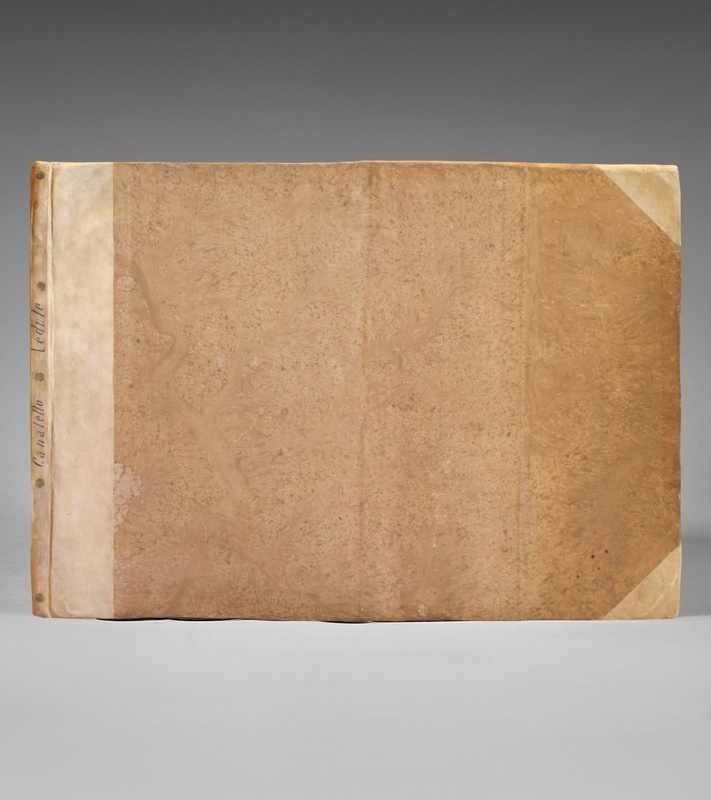 Quarter vellum, flat spine with hand-written title lengthwise, untrimmed. Contemporary binding. Katalog Berlin, 2713; Constable, Canaletto, II, pp. 673-674; Nessi, Una Venezia di Carte, p. 31, n° 16 (« Presentazione del Doge… »). 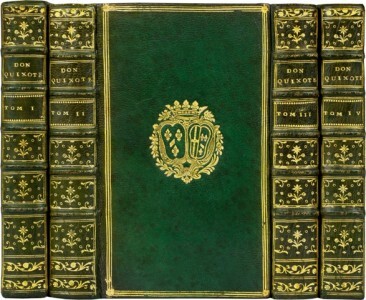 Extremely rare condition: very wide-margined (715 x 512 mm), in mint condition, preserved in its strictly contemporary Italian binding in quarter vellum. No other copy in this condition has appeared on the market since half a century. Suite composed of a title after Visentini and of 20 views, the whole engraved and etched by Giovanni Battista Brustolon. 14 of these views are adaptations after Canaletto and Visentini ; 4 are inspired by Marieschi and 2 are interpretations after Giambattista and Giuseppe Moretti. 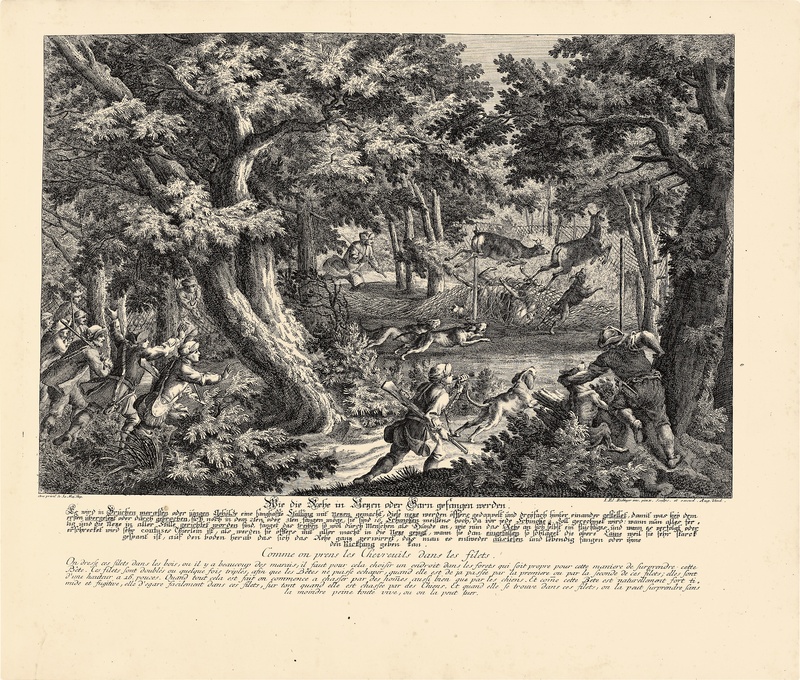 By their format, larger, and by the attention to detail, these 20 views are considered as true works of art; engravings dealers were not mistaken. In the 18th century, Venice « La Serenissima » had lost its important role in the European economic and political game in favour of Great Britain and the Netherlands. Behind the rich facades of the palazzi, Venice was deteriorating. The government was unable to support its artists by ordering them the execution of decoration works for the large palaces and buildings. At the beginning of the 18th century English aristocrats and some German noblemen profile themselves as the most important connoisseurs and buyers of the Venetian painters’ art. Venice and its timeless charm becomes in the 18th century the favourite subject of painters called “Vedutistes”. Their views of Venice quickly spread in Europe and make of the veduta, the most collected genre and one of the most appreciated by the public, still nowadays. Undisputed master of the veduta, Giovanni Antonio Canal, said Canaletto (Venise 1697-1768) marks his century by anchoring in his paintings the different faces of the Venise of his era. Besides the Piazza San Marco and the Grand Canal, immediately recognizable, we can see the campi and the churches of Venice, as well as views of the laguna, of daily life or of celebration days. Theater painter during his youth, Canaletto succeeded in associating a high sense of staging, a technique of perspective that he perfectly masters, with some very attractive light effects. We owe to Canaletto the most beautiful and innovative views of Venice, sources of inspiration for his followers. 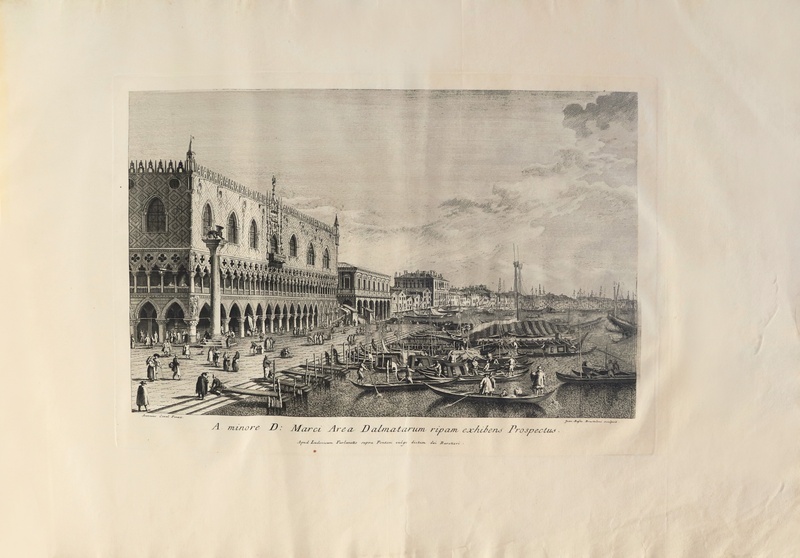 « Suite of very beautiful Venetian Views engraved by J.B. Brustolini. 1763. Large oblong fol. This work contains the most beautiful views of this famous city and of its surroundings, in 20 leaves. » (Catalogue des estampes du cabinet de ma dame la comtesse d’Einsiedel, n°248). Michele Marieschi (1710-1743), almost from the same generation as Canaletto, is considered as his brillant concurrent. But he differentiates himself with his taste for unexpected angle views. Native of Val Zoldone, Brustolon (ca 1716-1796) settled in Venice from 1733 as a book illustrator for G. Zerletti A. Girardi, Fr. Pitteri and the two great editors, A. Zatta and G. Pasquali. 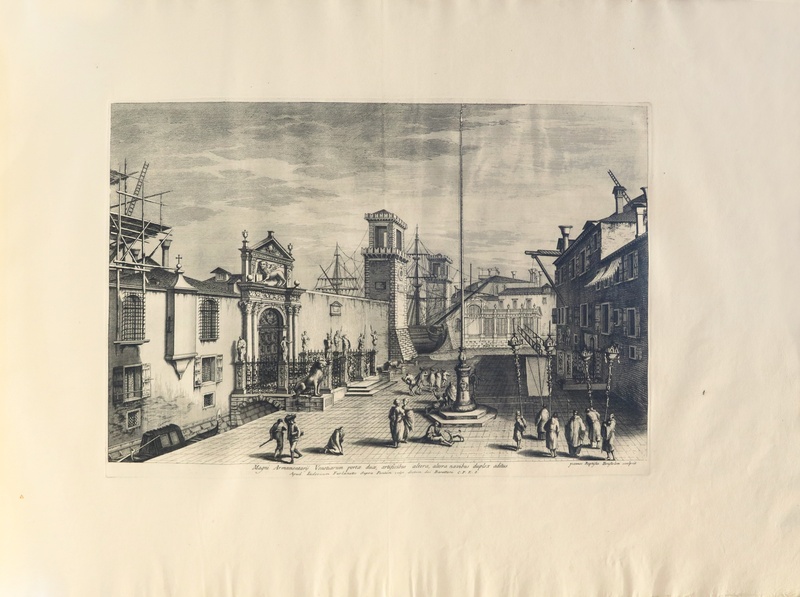 Apprentice in the shop of Giuseppe Wagner, Brustolon was very early initiated to the art of engraving and became one of the best Venetian engravers of the 18th century. 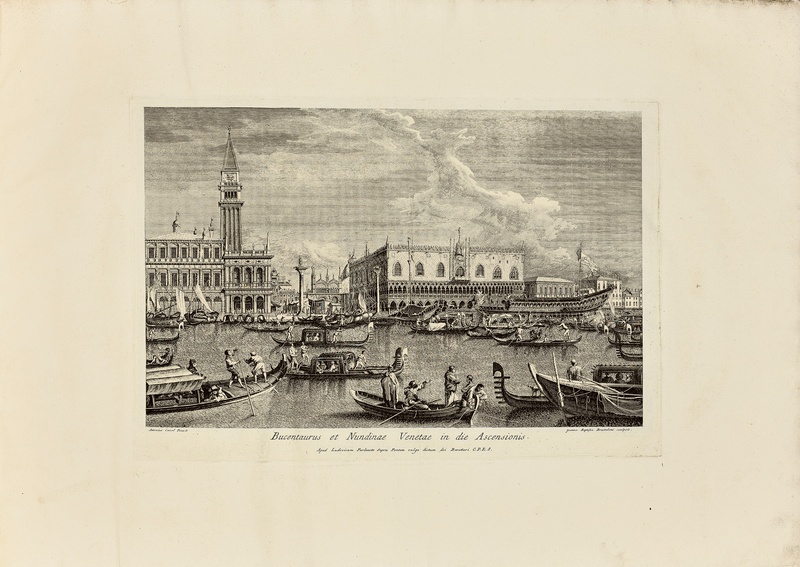 Probably at the initiative of the Consul Smith, Furnaletto ordered him this series of engravings on Venice and its architecture. 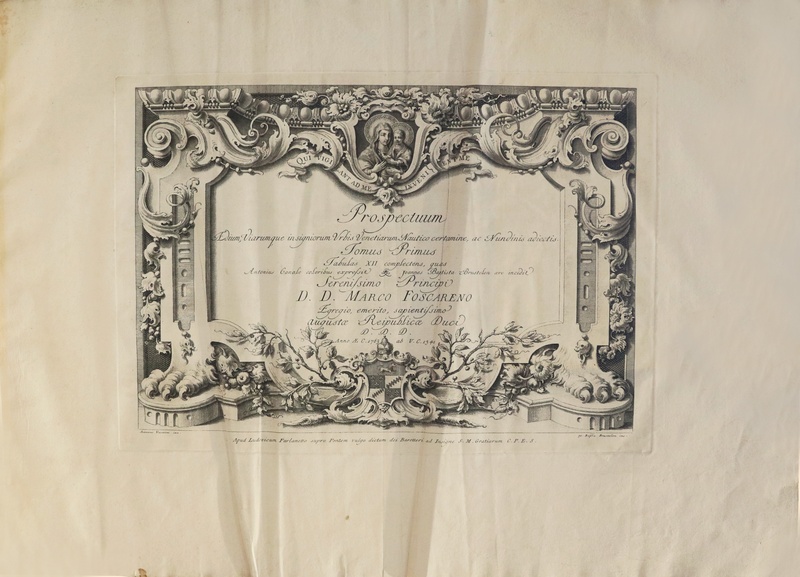 Their second collaboration was a series known under the name of « Feste Dogali », started in 1766 and finished in 1779, consisting in a suite of 12 views. Copy from the first state, before the numbers, in its flat presentation, the most coveted one. The views are beautifully printed, untrimmed. The paper kept all its freshness. A few folding marks. 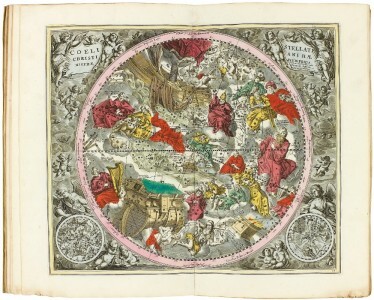 A 21st plate, « Presentazione del Doge in an Marco », was added to the volume. Coming from the series « Feste Dogali », it belongs to the issue with the numbers, the second out of four. -Sotheby’s, 5th of December 1996. Contemporary morocco with the arms of Foscarini. 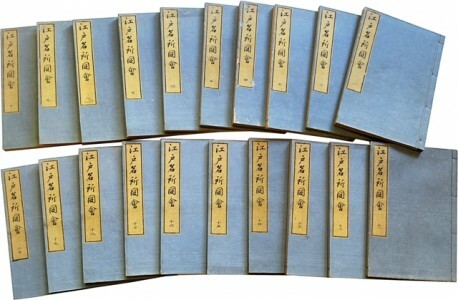 Copy including the title and the 11 views of the first volume only. Repair on one plate. Sold 52 700 $ 22 years ago. 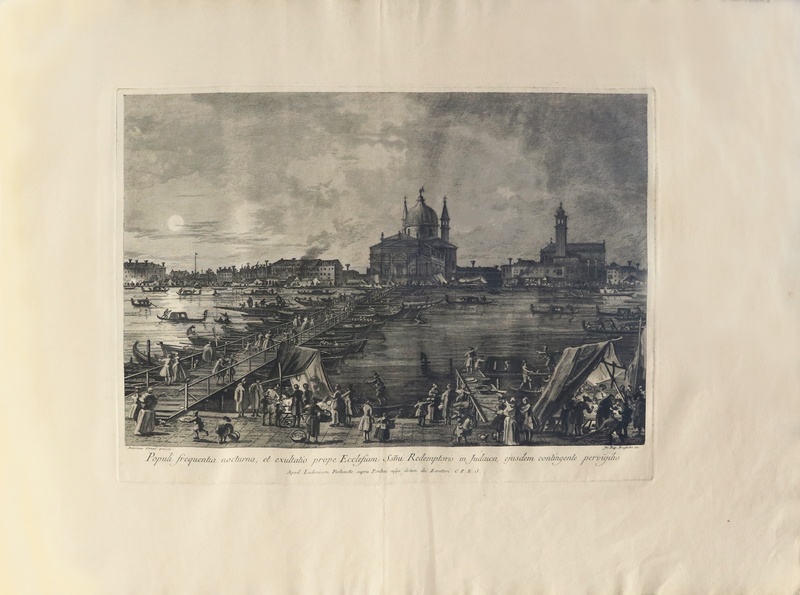 -Sotheby’s, 2003 : complete with the frontispiece and 20 views of the first edition from 1763; were added the two views of the definitive edition of 1778 and an incomplete work of 18 plates out of 24 of the views of Venice by Sandi from 1779. Later binding from the 19th century; largely trimmed copy 430 x 310 mm against 512 x 720 for our copy. Second state with the engravings number for the suite by Canaletto against first state before numbers for our copy. Sold as such 66 000 € 15 years ago. Provenance: ancient storage label, unidentified. 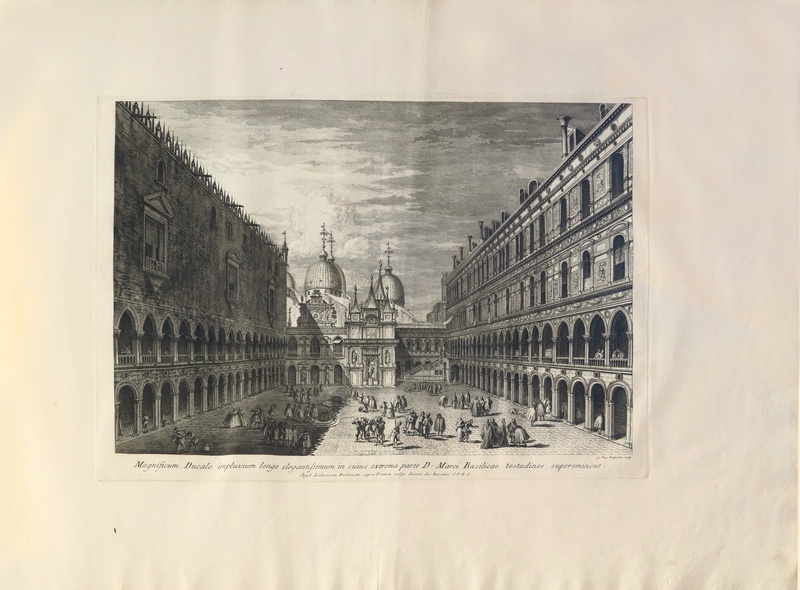 First edition and first state of this ravishing and superb suite of views on Venice.Katalog Berlin, 2713; Constable, Canaletto, II, pp. 673-674; Nessi, Una Venezia di Carte, p. 31, n° 16 (« Presentazione del Doge… »). Extremely rare condition: very wide-margined (715 x 512 mm), in mint condition, preserved in its strictly contemporary Italian binding in quarter vellum.No other copy in this condition has appeared on the market since half a century. Suite composed of a title after Visentini and of 20 views, the whole engraved and etched by Giovanni Battista Brustolon.14 of these views are adaptations after Canaletto and Visentini ; 4 are inspired by Marieschi and 2 are interpretations after Giambattista and Giuseppe Moretti.By their format, larger, and by the attention to detail, these 20 views are considered as true works of art; engravings dealers were not mistaken. Venice and its timeless charm becomes in the 18th century the favourite subject of painters called “Vedutistes”. Their views of Venice quickly spread in Europe and make of the veduta, the most collected genre and one of the most appreciated by the public, still nowadays.Undisputed master of the veduta, Giovanni Antonio Canal, said Canaletto (Venise 1697-1768) marks his century by anchoring in his paintings the different faces of the Venise of his era.Besides the Piazza San Marco and the Grand Canal, immediately recognizable, we can see the campi and the churches of Venice, as well as views of the laguna, of daily life or of celebration days. Theater painter during his youth, Canaletto succeeded in associating a high sense of staging, a technique of perspective that he perfectly masters, with some very attractive light effects. We owe to Canaletto the most beautiful and innovative views of Venice, sources of inspiration for his followers. Native of Val Zoldone, Brustolon (ca 1716-1796) settled in Venice from 1733 as a book illustrator for G. Zerletti A. Girardi, Fr. Pitteri and the two great editors, A. Zatta and G. Pasquali.Apprentice in the shop of Giuseppe Wagner, Brustolon was very early initiated to the art of engraving and became one of the best Venetian engravers of the 18th century.Probably at the initiative of the Consul Smith, Furnaletto ordered him this series of engravings on Venice and its architecture.Their second collaboration was a series known under the name of « Feste Dogali », started in 1766 and finished in 1779, consisting in a suite of 12 views. Copy from the first state, before the numbers, in its flat presentation, the most coveted one.The views are beautifully printed, untrimmed. The paper kept all its freshness. A few folding marks. A 21st plate, « Presentazione del Doge in an Marco », was added to the volume. Coming from the series « Feste Dogali », it belongs to the issue with the numbers, the second out of four. -Sotheby’s, 5th of December 1996. Contemporary morocco with the arms of Foscarini. Copy including the title and the 11 views of the first volume only. Repair on one plate. 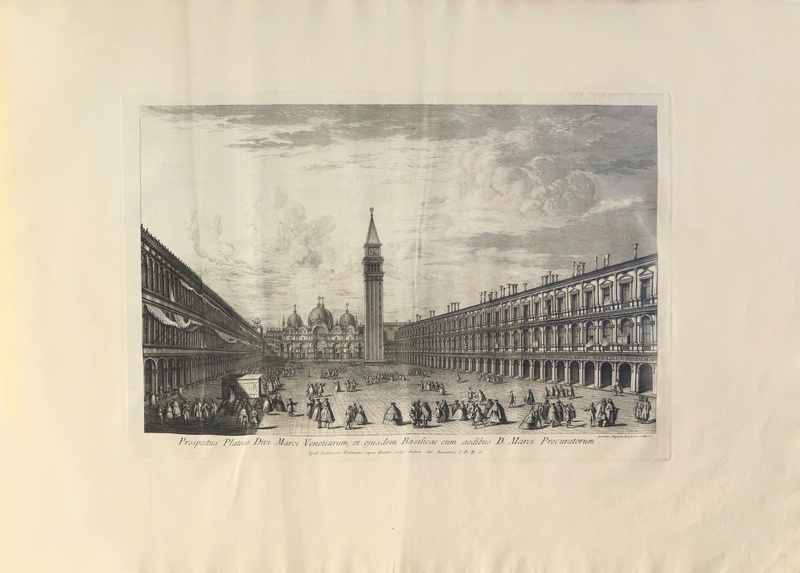 Sold 52 700 $ 22 years ago.-Sotheby’s, 2003 : complete with the frontispiece and 20 views of the first edition from 1763; were added the two views of the definitive edition of 1778 and an incomplete work of 18 plates out of 24 of the views of Venice by Sandi from 1779. Later binding from the 19th century; largely trimmed copy 430 x 310 mm against 512 x 720 for our copy. Second state with the engravings number for the suite by Canaletto against first state before numbers for our copy. Sold as such 66 000 € 15 years ago. Fürstenlust… Parfaite & exacte Representation des Divertissemens de Grands Seigneurs où Parfaite Description des Chasses de toutes sortes des Bêtes. Selon les diverses manières des Chasses, de la Nature des Bêtes,… [six parties] inventées et gravées par Jean-Elias Ridinger. Antiquités de la Nubie, ou Monumens inédits des bords du Nil, situés entre la première et la seconde cataracte. 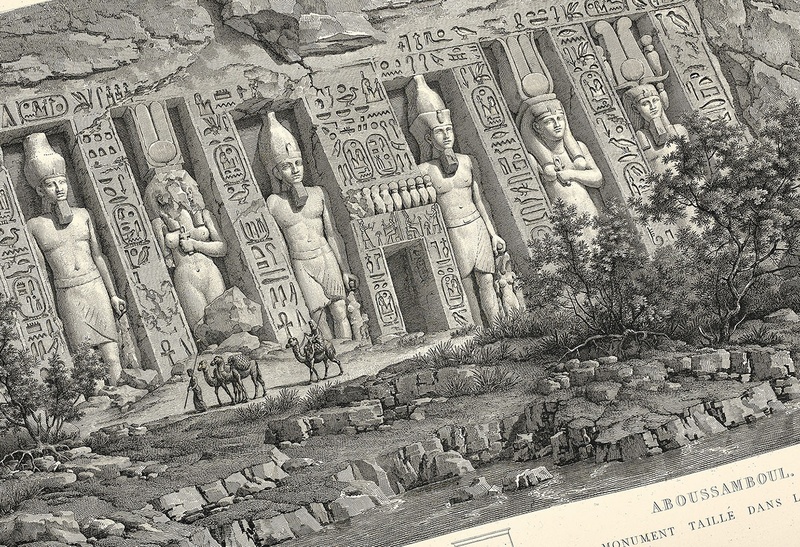 Dessinés et mesurés en 1819, par F.C. Gau, architecte. Ouvrage faisant suite au grand ouvrage de la commission d’Egypte dédié au roi. Vida y Hechos del Ingenioso hidalgo Don Quixote de la Mancha, compuesta por Miguel de Cervantes Saavedra con muy bellas Estampas gravadas sobre los dibujos de Coypel, primer Pintor de el Rey de Françia.